This month, the Nonprofit Research Collaborative, which gathers information on fundraising success, released a report on its most recent survey. Responses were compiled from 945 nonprofits in the United States and Canada (not a representative sample). While past NRC reports have focused on donor engagement, development staffing, and board participation in fundraising, this time they explored whether having an annual fund was associated with meeting overall fundraising goals. They also share findings on renewal rates, donation upgrades, and donor benefits. NRC’s survey defined an annual fund as “a fundraising drive to raise funds for the current year’s expenses.” Overall, 7 in 10 of the organizations surveyed did have an annual fund, and 88% of them tracked their renewal rate. The survey then asked if a nonprofit was on track to meet its overall fundraising goal for the year. 77% of organizations with an annual fund were on track, while 57% of those without were also on pace. Having an annual fund made a nonprofit significantly more likely to be meeting their overall goals. The report explained, “It is likely that there is also a relationship between planning for fundraising and having an annual fund.” In other words, having an annual fund may indicate that an organization is more prone to plan for its fundraising activities. The likelihood of having an annual fund varied among different types of nonprofits. Interestingly, arts organizations were most likely to have an annual fund (83%), followed closely by religious organizations (82%). 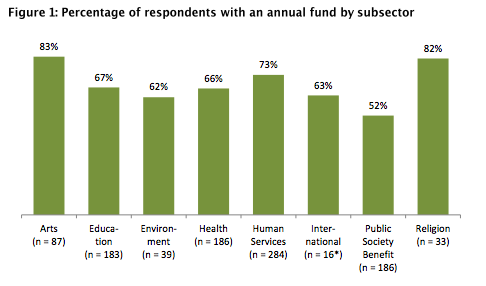 Nonprofits classified by NRC as “Public Society Benefit” organizations were the least likely to have an annual fund (52%). This category included social science and scientific research institutes, community foundations, and civil rights entities. Having established that nonprofits with an annual fund were more likely to be on track toward their overall fundraising goal, the NRC report examined the renewal rates of these annual funds. The majority of organizations (63%) had 60% or more donors renew. 13% of nonprofit annual funds had between 50% and 60% renew and only 12% had renewal rates below 50%. Unsurprisingly, annual funds with renewal rates above 50% were more likely to see an increase in contributions. In short, high renewal rates were associated with annual fund growth. Along with renewal, the number of annual donors who increase or “upgrade” their gift can also impact fundraising success. NRC’s survey asked respondents what percentage of renewing donors gave more than last year. The largest portion (36%) of organizations reported that 5.1-10% of their donors upgraded, followed by 23% who said 11-15% upgraded. 1 in 5 nonprofits with annual funds, however, saw 5% or less increase their gift. This segment was less likely to report an increase in annual fund contributions. The survey showed that both high renewal rates and high upgrade rates were associated with annual fund growth. Many nonprofits incorporate named giving levels, donor premiums, and memberships into the fundraising campaigns. NRC asked respondents about these engagement strategies, but found little association with success in meeting fundraising goals. The exception was larger organizations (budget ≥ $1 million) who had an annual fund. This group was more likely to be on track to reach its goals if it had gift clubs. For organizations with less than $1 million in total revenue, however, “there is no statistically significant difference in reaching their goal with or without gift clubs or levels.” Offering membership or donor benefits also did not increase or decrease a nonprofit’s likelihood to meet its goals. • Organizations with an annual fund were more likely to be on track to reach their overall fundraising goal for the year. 77% with an annual fund were on track, while only 57% without were on track. • High retention of annual donors was associated with an increase in the annual fund’s contributions. A greater percentage of upgrading donors was also associated with annual fund growth. • Gift clubs, memberships, and donor benefits did not show a significant association with meeting fundraising goals. The exception was organizations with a budget of $1 million or more, who also had an annual fund.